Satoru Iwata responds to fears of New Super Mario Bros. saturation. Nintendo's mascot Mario has appeared in countless games spanning all of its consoles, and the release of two New Super Mario Bros. titles in the same year has led to questions of whether the company is releasing Mario games too frequently. Company president Satoru Iwata has replied to these questions, claiming that the release rate is just right for him. Working on two side-scrolling Mario titles at the same time while trying to keep them distinct has been challenging, and Iwata told Kotaku that this is an unusual state of affairs for the company. "We only create a New Super Mario Bros. title once per platform," he said, and this is how he hopes it will stay. "I think we'll probably go ahead and continue at that pace." He admitted, though, that the future of the Mario series is not necessarily his decision to make, adding, "that's probably [series creator Shigeru] Miyamoto's choice, so I can't give you a 100% guarantee that that's the pace we'll continue at." Iwata also hopes that the new games, New Super Mario Bros. 2 on 3DS and New Super Mario Bros. U on Wii U, will not feel unoriginal despite their similarities. "They do share a name and there are some components that are similar," Iwata said. "That being said, these are two very unique and separate titles [...] I believe the two titles are unique enough that I wouldn't say that I'm super-worried that people are going to be confused." 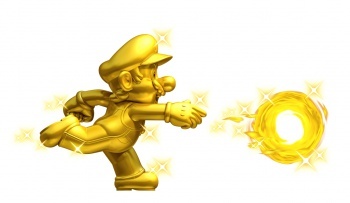 One new feature that New Super Mario Bros. 2 is bringing to the series is paid DLC. DLC is a familiar sight in many recent games on other consoles, but it's something that Nintendo has only recently considered. Although it's a new area for the company, Iwata wants fans who are fearful of the change to know that they will not be given a raw deal. "Our goal," he stated, "is to create DLC in such a way that consumers do not feel that they have been cheated or deceived." Indeed, Nintendo has adopted this idea as part of its company policy. "What we are not going to do is create a full game and then say, 'let's hold this back for DLC.' That's not our plan."